It's the moment we've been waiting for all winter long: Daylight Savings Time. 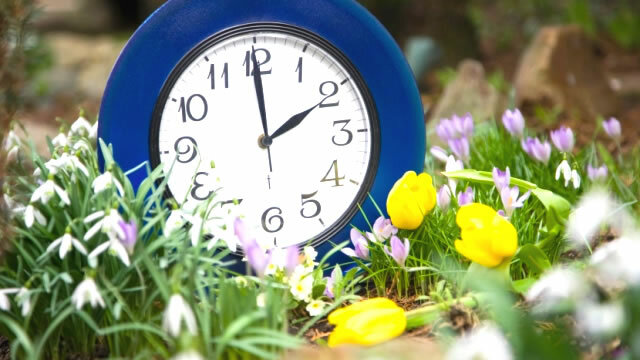 This weekend's 'Spring Forward' time change (Sunday, March 10th) marks the first sign of the changing of seasons. While there’s never a good time to find issues with your air conditioner, the sooner you can identify them the better! Switch your system to ‘cool’ mode before the first hot day arrives to avoid the uncomfortable inconvenience of an A/C malfunction. Twigs, branches and other debris can accumulate around your air conditioner after the fall and winter seasons. Do your part to ensure that nothing is blocking or preventing your system from operating at it’s full potential. Winter can take a toll on your HVAC system. Start spring on the right foot with a new or freshly cleaned furnace filter. It will be important in the coming weeks when allergy season begins! Now is the perfect time to go around to all of your smoke and carbon monoxide detectors to ensure they are working. Just because you will be using your furnace less, doesn’t mean your chances for a CO leak or house fire are eliminated. Why wait until the end of May to schedule your air conditioner tune-up? Get a head start on spring by having your A/C maintenance done before the hot weather hits! Will your air conditioner make it through another summer season?